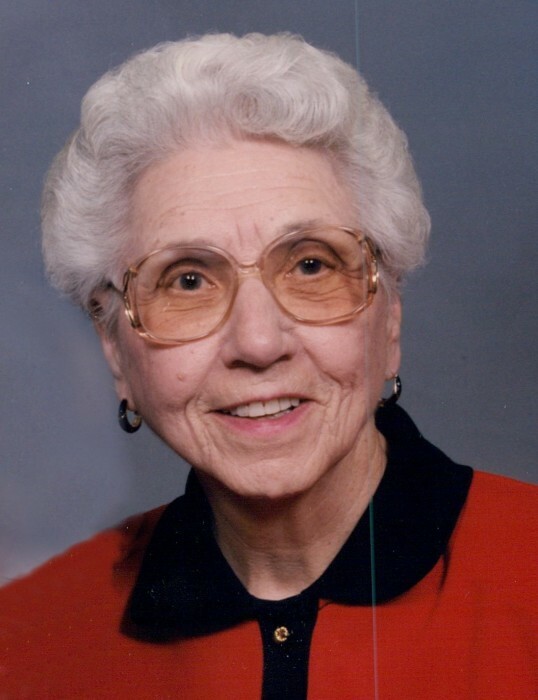 Oneta Forsythe, age 99, of Sanborn, Iowa formerly of Laurens, Iowa died on Sunday, January 12, 2019 at the Prairie View Nursing Home in Sanborn. Funeral services will be held on Saturday, January 19, 2019 at 2:00 p.m. at the Powers Funeral Home, Main Street Chapel, in Laurens. Burial will be in the Laurens Cemetery in Laurens. Visitation will take place one hour prior to the service at the funeral home. The Sliefert Funeral Home in Storm Lake is in charge of the arrangements. Oneta Lucille Horsman, the daughter of James Henry and Myrtle Irene (Williams) Horsman, was born at Plover, Iowa, on August 21, 1919. She lived her youth in the Plover community and graduated from the Plover High School with the Class of 1936. Oneta began her banking career at the Laurens State Bank in 1946 and retired from there in 1984. On November 7, 1987, Oneta was united in marriage to her best friend, who became her husband, Fred Forsythe, Jr. at the United Methodist Church in Laurens. They were blessed to spend 26 years together. Oneta and Fred spent 17 winters in Arizona and the remainder of their time in Laurens. They sold their home in Arizona in 2005 and continued to reside in Laurens. Freddie and Oneta moved to Sanborn, Iowa in March of 2008 where they resided at the Prairie View Manor Independent Living and the past months Oneta had made her home at the Prairie View Inn. Oneta was a member of the Laurens United Methodist Church since 1938, the Order of Eastern Star and a charter member of the Wo-Tan-Ye Club in Laurens. Special hobbies of Oneta’s included doing crocheting and needlepoint and throughout her lifetime she enjoyed entertaining her family and friends and traveling. Oneta’s life is loved and cherished by her family which include her very special sister, Shirley Smith, of Sanborn, Iowa, her nephews and nieces: Bradley (Joy) Smith of Storm Lake, Iowa and Jeffrey (Karen) Smith of Zionsville, Indiana, Ann Vice and Paula Horton of Florida, Donald (Karen) Forsythe of Overland Park, Kansas, Lois Balodis of Scottsdale, Arizona, Eleanor (Fran)O’Brien of Sun City West, Arizona, and Elwood (Gail) Forsythe of Scottsdale, Arizona, her great nephews: Matthew (Yvonne) Smith of Sioux Falls, South Dakota, Michael Smith of Marion, Ohio, Sean (Jaclyn) Smith of Rock Valley, Iowa, and Joshua Smith of Franklin, Tennessee, , her great niece: Trisha (Tim) Huset of Verona, Wisconsin, her great great nieces and nephews: Emma Smith, Kinsey (Chris) Houlahan, Aly McDonald, Jacob McDonald, Carson, Adelyn and Caden Smith, Tanner and Brayden Huset, Averey and Emerson Smith, her great great great nephews and niece: Seth, Lucas and Callie Houlahan, other extended family and many life-long friends. She was preceded in death by her parents, her husband, Fred on February 6, 2014, her brother and sister-in-law: Commander Donald (Effie) Horsman, USN, her brother-in-law: James Smith and her nephew: Todd Smith her niece: Linda Horsman.